The sale of one of the country's largest farming operations is to test Brexit's impact on farmland prices. 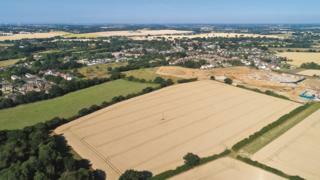 The 100-year-old Strutt & Parker (Farms) Ltd is up for sale for an estimated £200m and includes more than 30,000 acres of East Anglian farmland. Land prices have been falling since 2015 amid uncertainty over the continuation of subsidies for farmers. The government has guaranteed farming subsidies at the current EU level only until the 2022 election. The privately owned Strutt & Parker received £1,267,000 in subsidies through the rural payments agency in 2017. The whole business generates income of about £21m a year. The price of prime arable land peaked in 2014 at around £10,000 per acre and is now close to £9,000. Farmers have also said that the falling number of migrant farm workers is ramping up costs and reducing farms' profitability. This month, the government introduced a temporary visa scheme for up to 2,500 workers for the period immediately following the UK's departure from the EU in March next year. The land, which stretches across Suffolk, Cambridgeshire and Norfolk, also contains commercial and residential units, as well as renewable energy projects. The farming business includes four main farms, contracting and joint ventures, a sheep enterprise across Ministry of Defence land in Norfolk, a farming enterprise in Cambridgeshire and Lavenham Fen Farms. Last year, the company converted 34 acres of farmland into a natural burial site, Old Park Meadows near Chelmsford, which is included in the sale. The sale is being handled by Savills real estate agents and Deloitte. David Jones, a corporate finance partner at Deloitte, said: "In our experience, interest is likely to come from a number of sources, due to the scale and diverse asset base, and we anticipate there will be interest from both domestic and overseas high-net-worth individuals. "For the overseas buyer, the current weakness of the pound against the dollar adds to the attraction. We also anticipate enquiries from institutions looking for long-term asset-backed investments." Strutt & Parker (Farms) is separate from Strutt & Parker estate agents, although they were both founded by the same two families in the 19th Century.